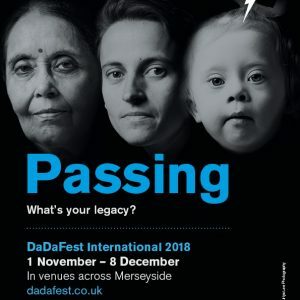 DaDaFest International returns to Liverpool City Region venues this autumn from 1st November to 8th December 2018, showcasing a series of high-quality cutting-edge work which challenges stereotypes and celebrate disability and D/deaf cultures. Comedian Francesca Martinez, theatre-maker and comedian Jess Thom, Stop Gap Dance Company, artists Faith Bebbington, Jonathan Griffith, Simon McKeown and Martin O’Brien, and multi-instrumentalist Sarah Fisher are among the 2018 line-up. 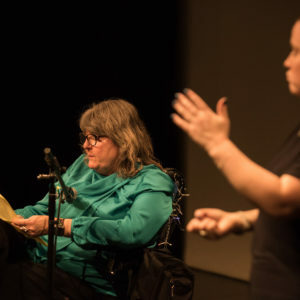 They are part of a busy programme that includes more than 50 exhibitions, performances, talks and workshops by both well-known mainstream audience artists and new emerging artists, all responding to the festival’s theme Passing: What’s your legacy? 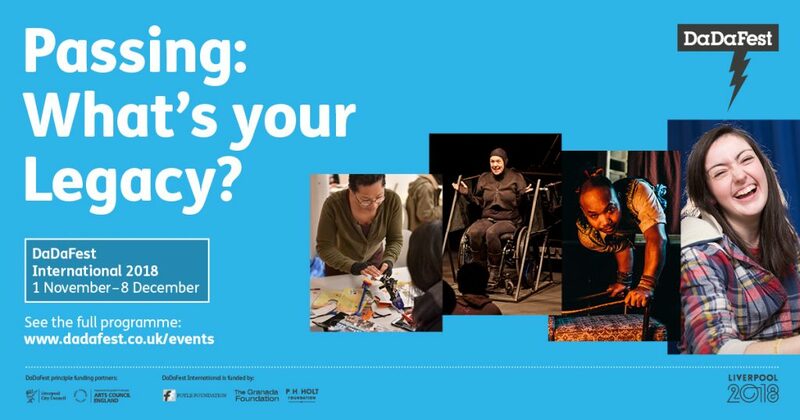 Artists have been invited to explore the concepts of ageing, death and disability (passing time) and the changing nature of all our journeys and the legacies we leave (passing on). 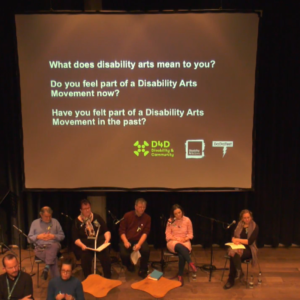 The festival will also commemorate the end of the First World War as a key moment for modern recognition of disability as a social construct. 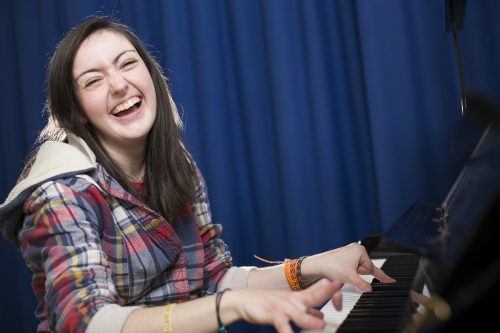 Events will be held at a wide range of venues across the city centre and beyond including St George’s Hall, Royal Court Liverpool, the Bluecoat, Tate Exchange, Constellations, the Unity Theatre and World Museum. Award-winning artist Simon McKeown’s interactive No Passengers vintage disability cars installation will be seen at St George’s Hall from 21 November – 8 December. 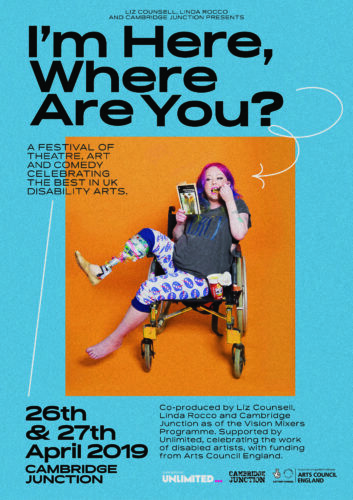 And this year DaDaFest is also expanding its geographical reach with a performance by the acclaimed Stop Gap Dance Company taking place at Storyhouse Chester. Visual art is represented by Gina Czarnecki whose special exhibition of eco-friendly coffins designed by local and national artists Who We Are Now will be staged in the Oratory in the grounds of Liverpool Cathedral from November 1-18. The Unity will host Jonathan Griffith’s Retrospective throughout the festival period, and the artist will take part in special talks at the theatre on November 20 and in Chester Lane Library in St Helens on November 22. And Martin O’Brien’s video installation Until The Last Breath is Breathed comes to St George’s Hall from November 21 – December 8. He will also be doing a performance lecture at the same venue on 29 November. Jess Thom showcases Samuel Beckett’s Not I, the story of a woman’s life told at top speed by a disembodied character, ‘Mouth’, at the Bluecoat on November 23-24.The Touretteshero and Battersea Arts Centre production in association with the Albany sees performer Thom reclaiming Mouth as a disabled character. Meanwhile laugh-out-loud comedy comes from Francesca Martinez (What the **** Is Normal) at the Unity Theatre on November 23 and to Chester Lane Library in St Helens on November 24. Laurence Clark will also be live at the Unity on November 24 with The Irresponsible Father’s Guide to Parenting. Finally, DaDaFest team up with Action Transport and Unity Theatre for a seasonal show collaboration, for the highly theatrical and bold retelling of the classic family tale – Beauty and the Beast! Beauty and the Beast shows that beauty really is in the eye of the beholder and that everyone’s attitude can, at times, be beastly! DaDaFest Artistic Director Ruth Gould said: “I’m delighted by the programme we’re presenting during DaDaFest International 2018. 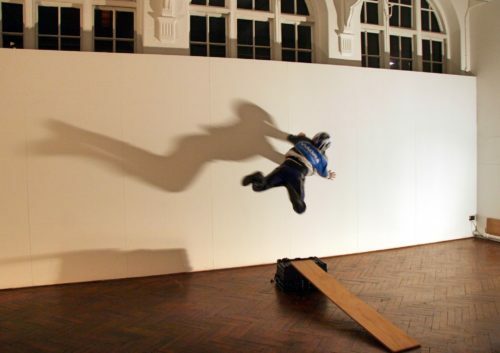 We have some fantastic, absorbing and thought-provoking work developed by hugely talented artists working across a wide range of genres, from dance to visual art, music to comedy. “The theme of this year’s festival, Passing: What’s your legacy? is a great starting point for conversations, both verbal and artistic, and I’m really looking forward to some exhilarating exchanges of thoughts and ideas over the course of DaDaFest International 2018. DaDaFest International talks and workshops programme will be announced 10 October.